Like many Greek myths, Arachne is a story that is constantly retold, and as a result, reinvented. Although many of the renditions are very similar, each version emphasizes different aspects of the original myth. Geared towards younger readers, the “Books That Grow” version of Arachne highlights the moral dimension of the story, but prunes it of the more sinister details found in Ovid’s account. In Ovid’s version, for example, Athena is impossibly vengeful and devoid of compassion, and Arachne ultimately kills herself. At its heart, Arachne is a story about pride and human limitation. 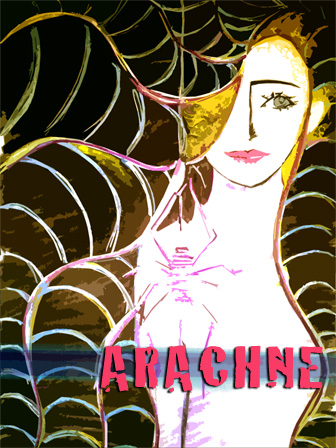 An incredibly talented Weaver, Arachne is a young girl who feeds on the praise of her patrons. Eventually, youth and inexperience, coupled with consciousness of her superb gifts, causes Arachne to boast that her weaving is better even than Athena’s. Hearing the boast from Olympus, not a minute is lost before Athena suddenly materializes, gray eyed, with her war-like visage. Athena gives Arachne an opportunity to retract her boast, but when she reasserts her claim, Athena challenges her to a weaving competition, with Zeus as the judge. The rules of the competition stipulate that the declared loser will never be able to weave with loom, spindle or distaff. Although Arachne performs admirably, Athena uses the sky as her loom, and all of the natural world as her materials, to produce a canvas so glorious and terrible that onlookers begin to weep. Arachne, conscious of her defeat, sulks away dejected. In a rare moment of godly compassion, Athena takes pity on Arachne’s unhappiness, and changes her form so she that will be able to weave without spindle or loom. Thus, Arachne becomes the first Arachnid. This piece is perfect as part of an introduction to myths, folktales and fables, particularly those designed for a younger audience. In addition, this piece also works well as part of a lesson on creation stories, and can be used to help inspire students to write their own creation myths. Based on your own experiences, how would you distinguish between being “confident” and being “prideful” ? In your opinion, how are these two similar? How are they different? Provides teachers with a number of engaging activities to supplement instruction on Arachne.